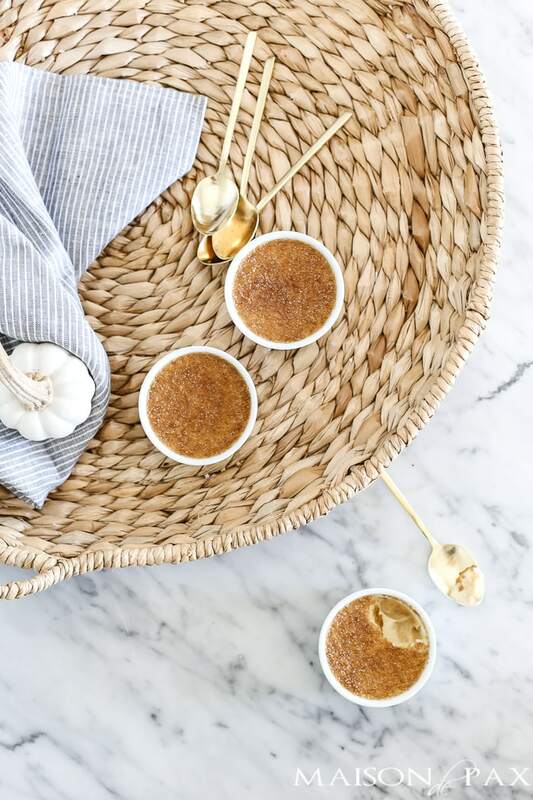 This year I’m bringing the softer side of fall to my home! And using a light hand to do it. 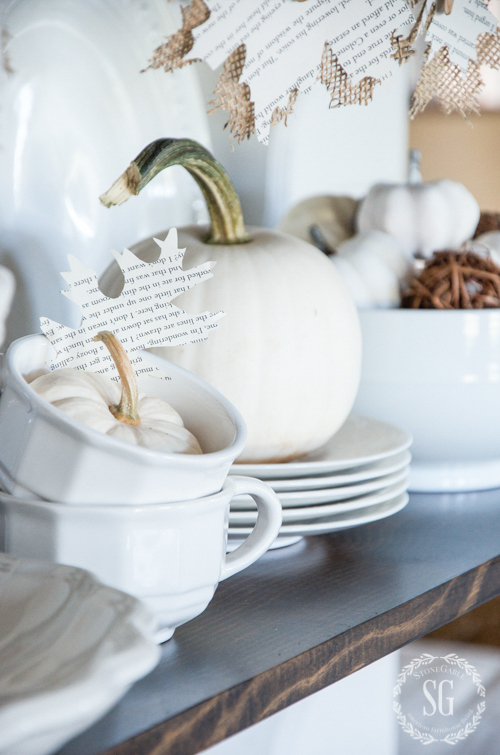 Fall at StoneGable is all about white pumpkins… large and small. I’ve also fallen in love with leaves made from burlap and old book pages. This is such an easy way to decorate for the season. Soft, white with splashes of orange, organic and natural. 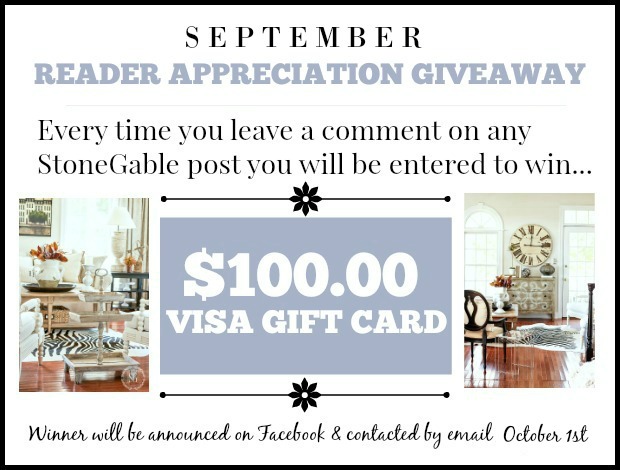 Come on over for a little fall inspiration! Today on our podcast Decorating Tips And Tricks WE’VE BEEN FLOORED! 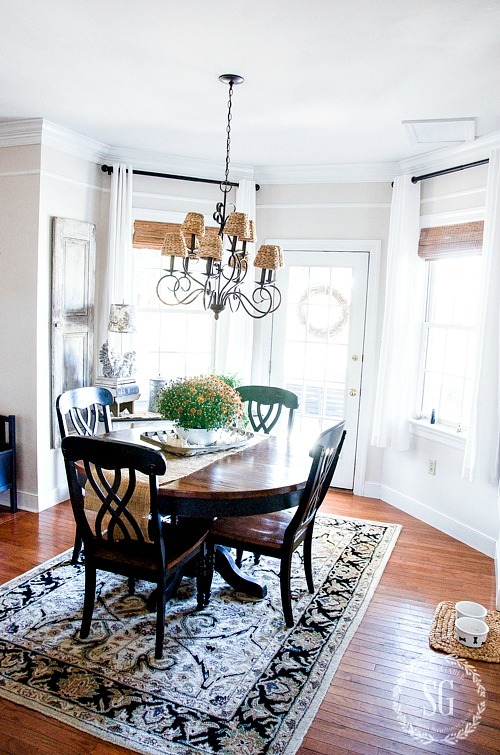 We are sharing with you our favorite and some pretty amazing flooring options to consider. It’s HOME STYLE SATURDAY! Our group has pulled the best from their archives to share with you! Today, I’m sharing the second half of my fall tour from last year! Enjoy! Fall in this area of our home is more laid back and relaxed. 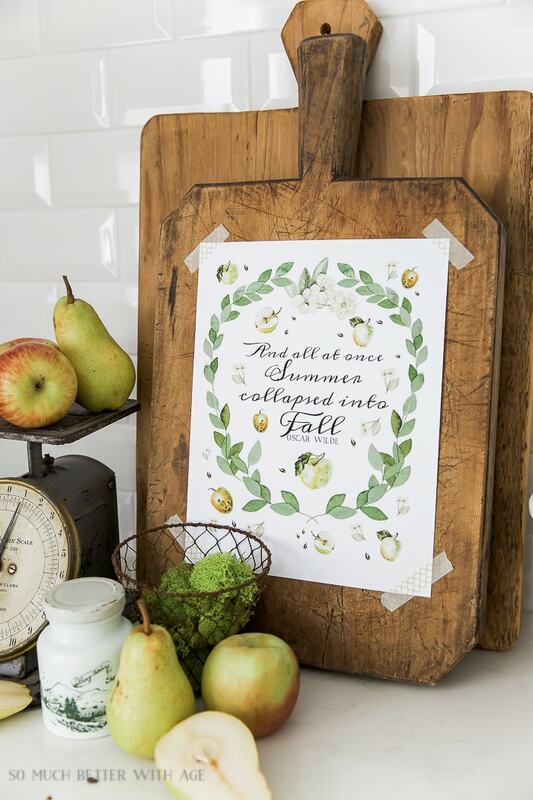 Fall means cooking! You will find me in my kitchens cooking lots of soups and pumpkin dishes. YUM! 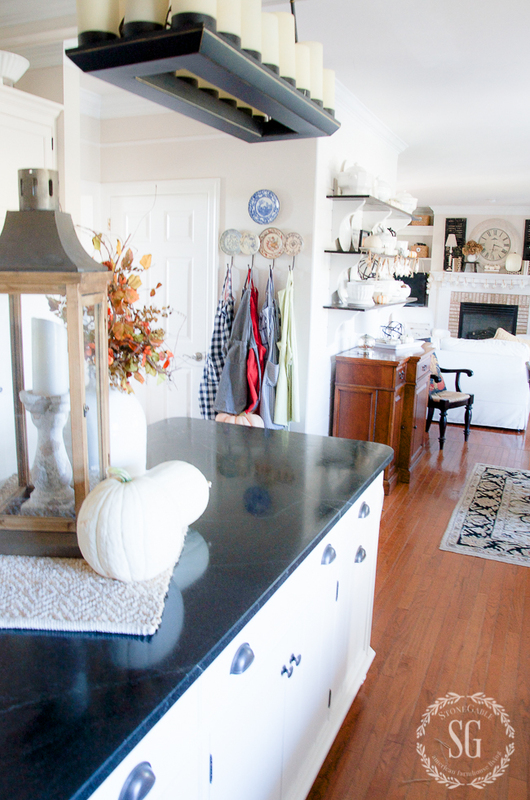 I like to keep my kitchen counters pretty free from lots of “stuff”. This kitchen gets used hard! So I take a minimalist approach to decorating in here. But I just can’t help adding a couple of sweet pumpkins! I have such a crush on lanterns and their soft evening glow in my home! 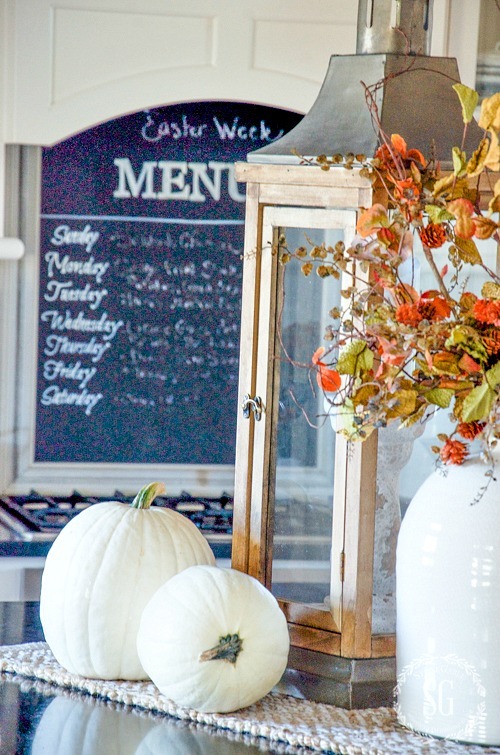 The breakfast room is also decked out for fall. In the new year, this area is in for a little overhaul! You can see where our little dog Scamp has dinner. He will be 20 in January and still in good shape! The mums in my area are gorgeous this year! I just had to bring a little orange burst of color into my home! I mixed them with baby boo pumpkins and small deer sheds in a tobacco basket. Across from the kitchen table are the bar and open shelves. Bobby planked this wall and installed the shelves. I keep these shelves filled with white dishes. This fall I added leaves and pumpkins to the dishes already there. 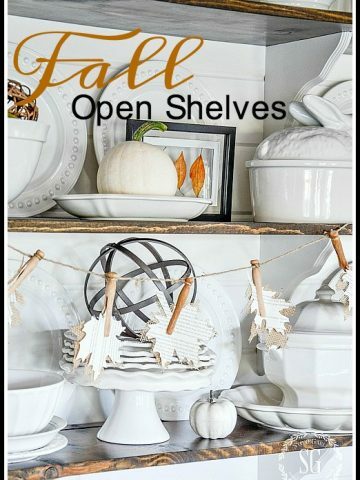 You can see more of the fall open shelves, HERE. 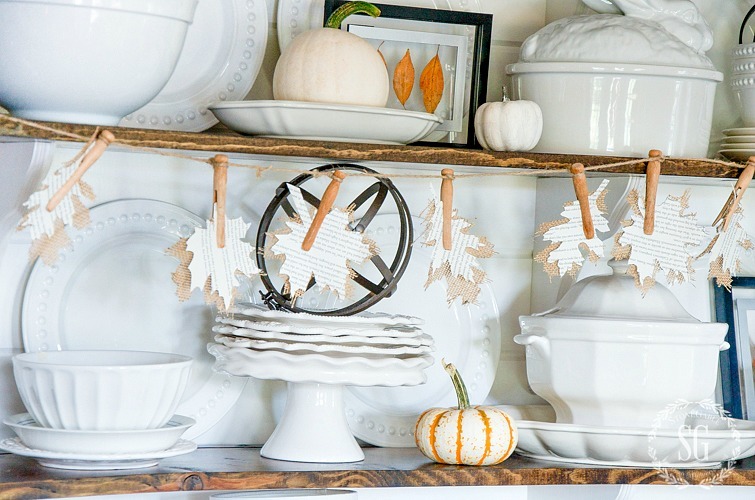 And you can make an easy fall garland like mine… see the tutorial HERE. The family room is where we unwind and relax! 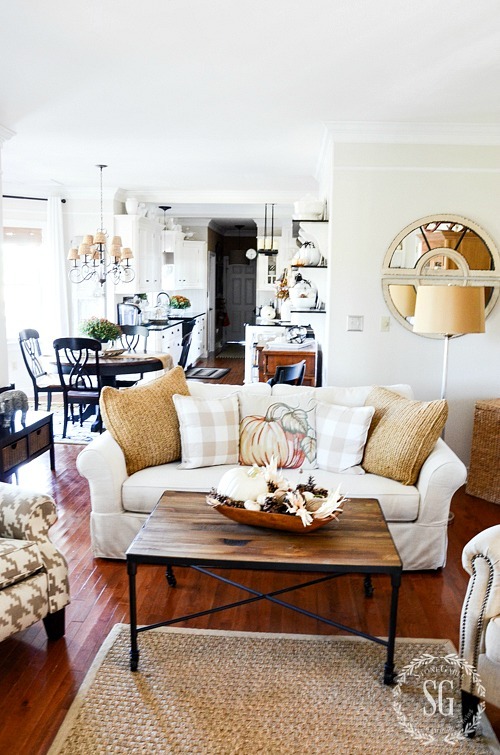 Our style is comfy, neutral and welcoming! Did you notice the new-to-me-desk we are now using as a table? I painted and antiqued it and made it quite grungy. I have one more really fabulous things to add to the desk. I can’t wait till it’s totally done! I’ll share it with you soon! 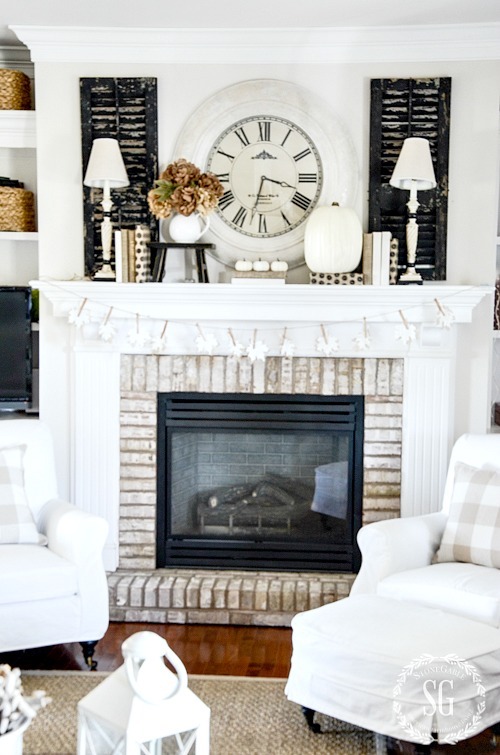 The mantel is the focal point of our room! To see more of it, click HERE. Every fall I treat myself to one new pillow. This pillow is really fabulous! It’s large, embroidered and soft colored. LOVE it! 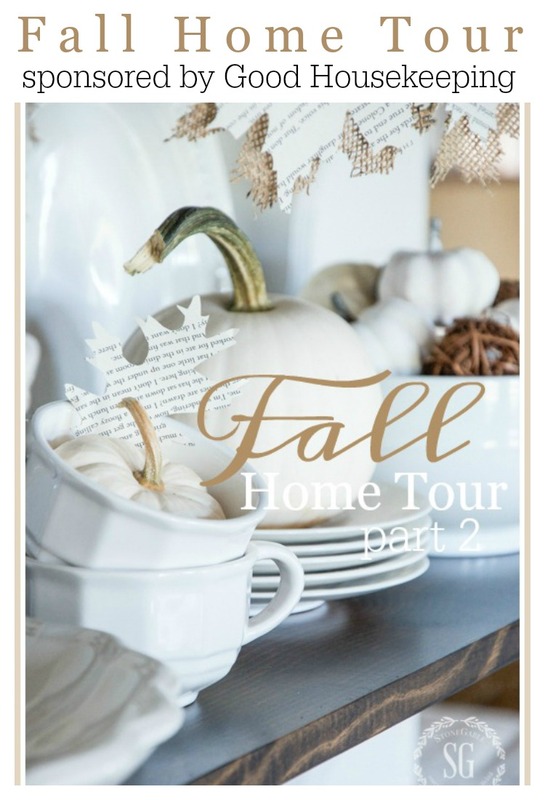 I’m so glad you stopped by StoneGable to see part two of my Fall Home Tour! 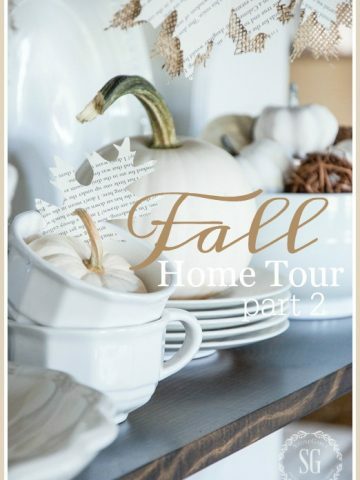 If you would like to see Part 1 of my Fall Home Tour, click HERE. Your little dog will be 20??!! That is amazing! 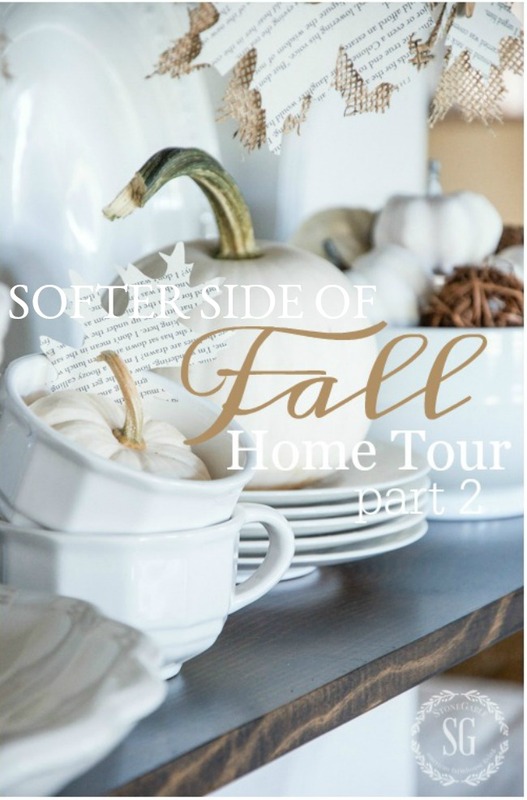 your second 1/2 of your fall home tour is just as beautiful as the first! ! !thanks for sharing. I just love the cut out leaf garland, recently I saw the cutest Christmas tree decorated with cut out trees with the edges glittered for a little sparkle -so sweet. please enter me into the drawing. The softer side is so pretty!! Love! 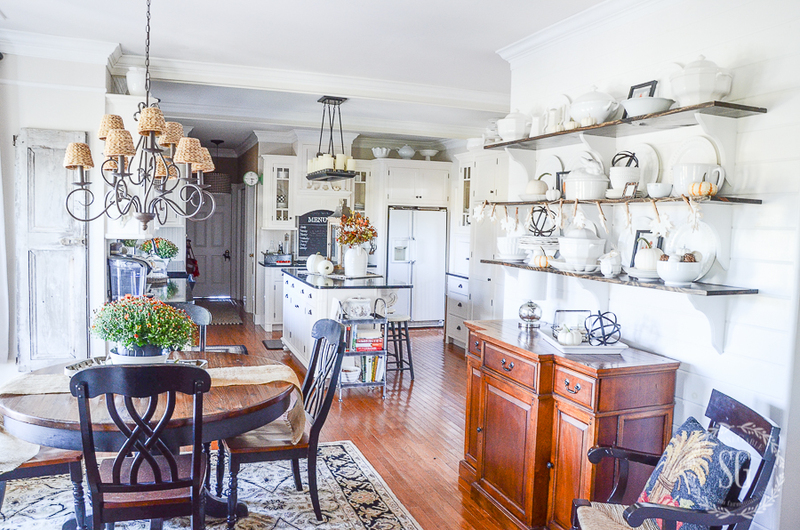 Yvonne, love your open shelves with all your white dishes and pottery. 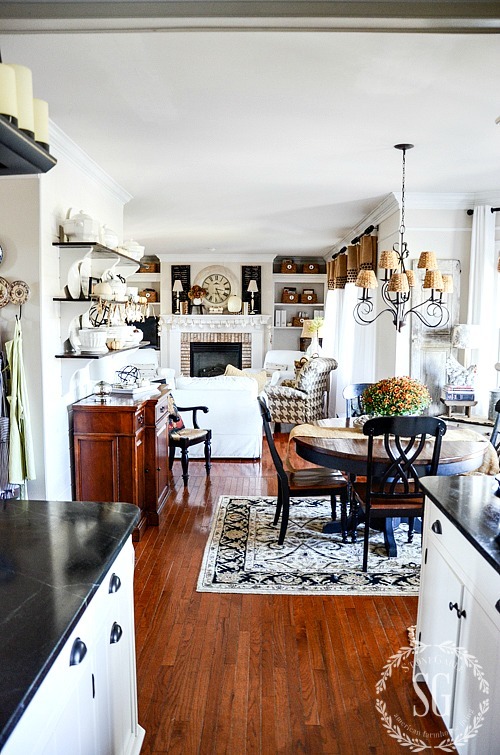 Your home should be on a House Tour to raise money for some organization in PA.
My first time on your site. Live all the white and gold fall softness! Can we see your dog Scamp please, amazing that he is nearly twenty. Sadly Scamp passed away 8 weeks before his 20th birthday. We miss him so! Love the leaf garland! And white pumpkins! 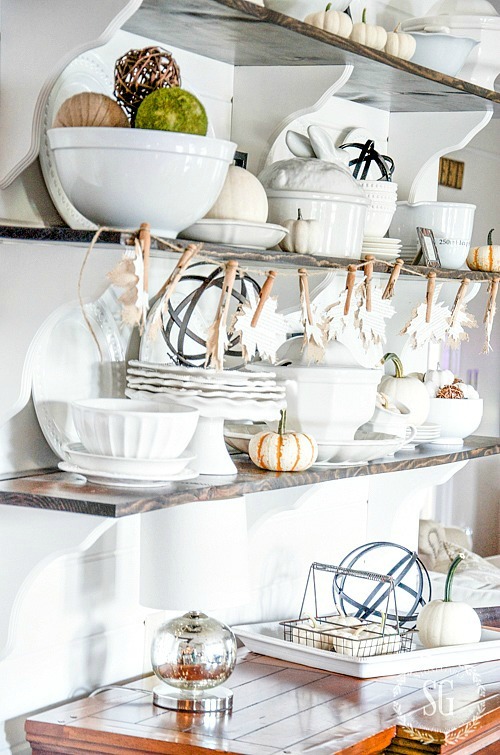 All these picture inspire me to get started on fall decorating! Thanks!! I loved touring your place. 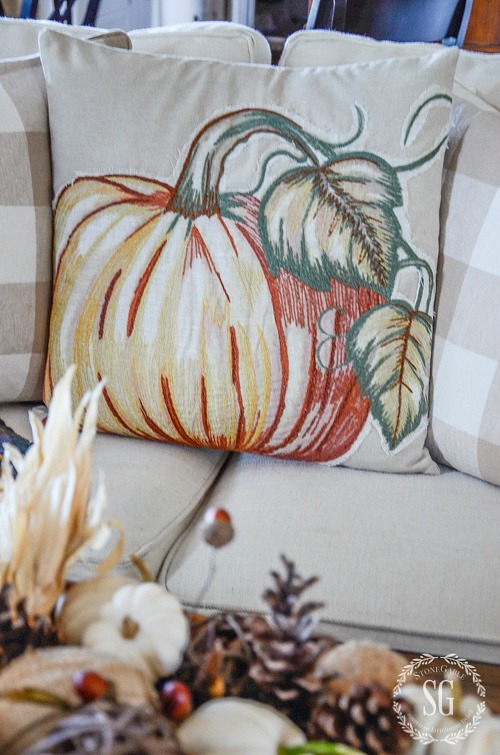 All the fall touches were perfect, especially the embroidered pumpkin pillow. 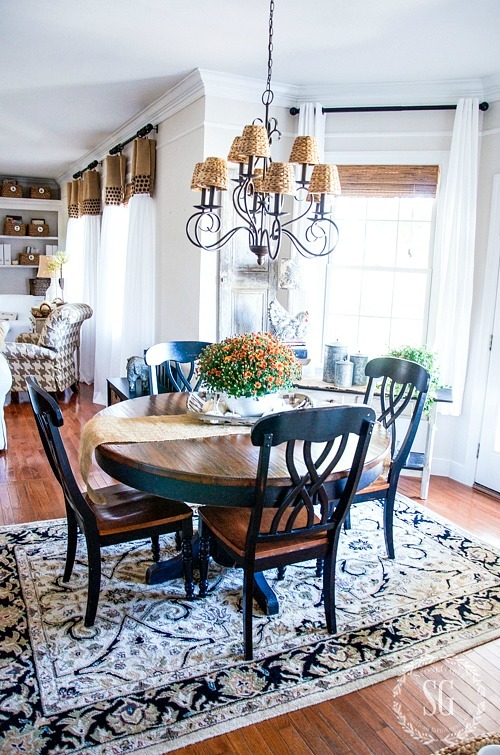 Also I love the wicker shades on the chandelier over your table! Thank you for sharing the fall tour with us. What I’m used to viewing are close-up photos of your rooms. 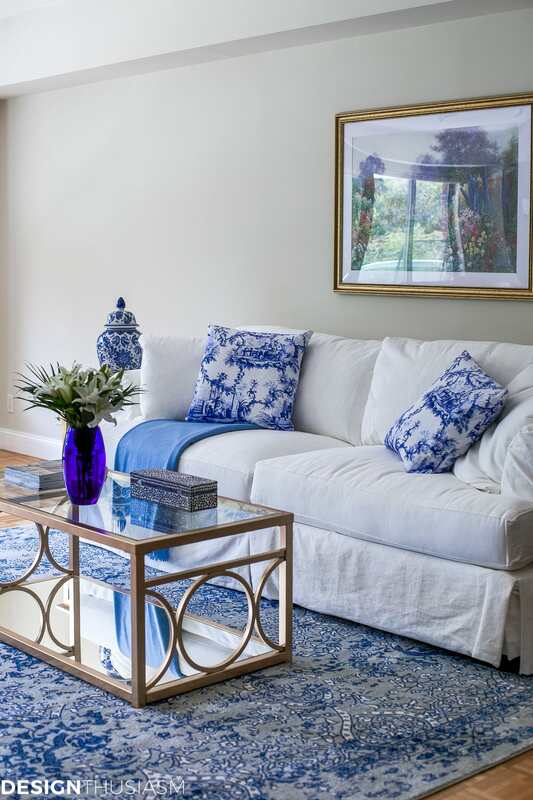 The full shots make me appreciate how well thought out your color scheme seamlessly goes from one room to the next. 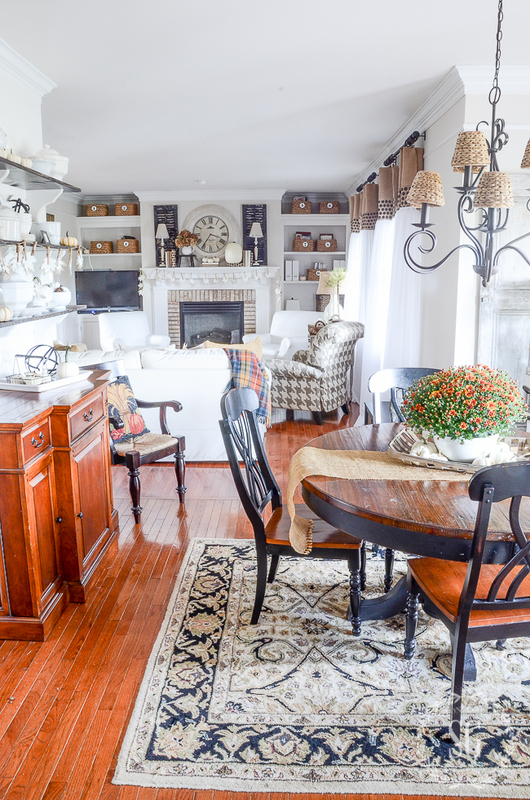 Your burlap curtains pick up the basket colors in the shelves. The shade colors also repeat that hue and the floors seem to add to the richness of the view. I’d never appreciated your keen eye for that specific color detail. What a lot of ideas and tips you share each week. I like your white pumpkin theme. I still like your garland too. Unexpected fun! I look forward to your kitchen update!! Your house looks so pretty all over again! 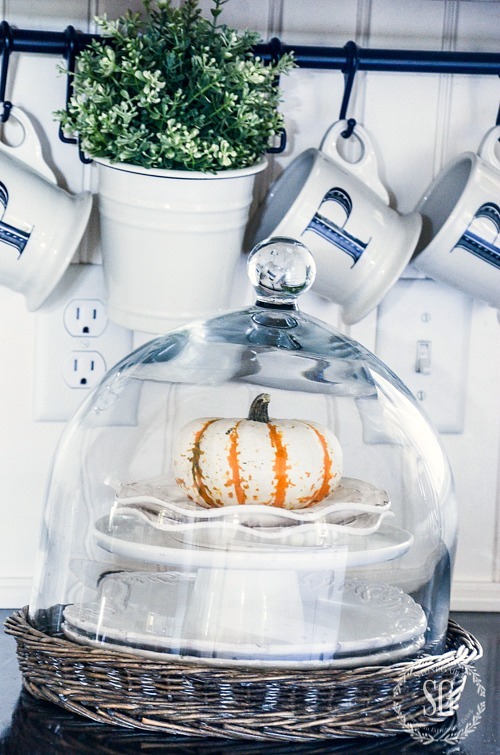 I love Fall and I love all the little details that together bring out the season. I’m still on the hunt for white pumpkins. Love the new pumpkin pillow! 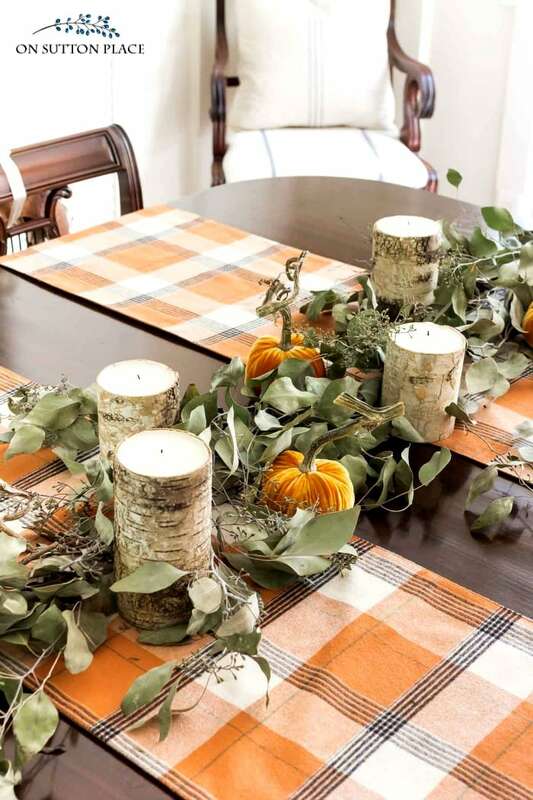 And the lanterns, pumpkins, plaid throw … and on and on! 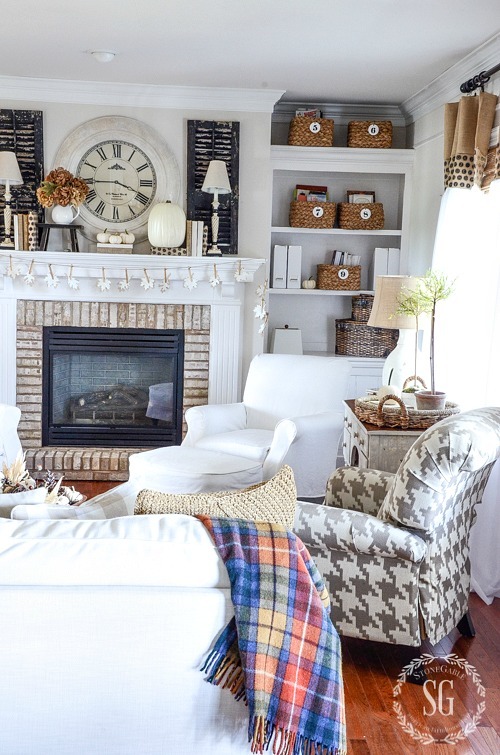 I like the mix of whites w a few dark woods and white soft decor items mixed w the colorful blanket. Hard to do…..but you did a fabulous job. 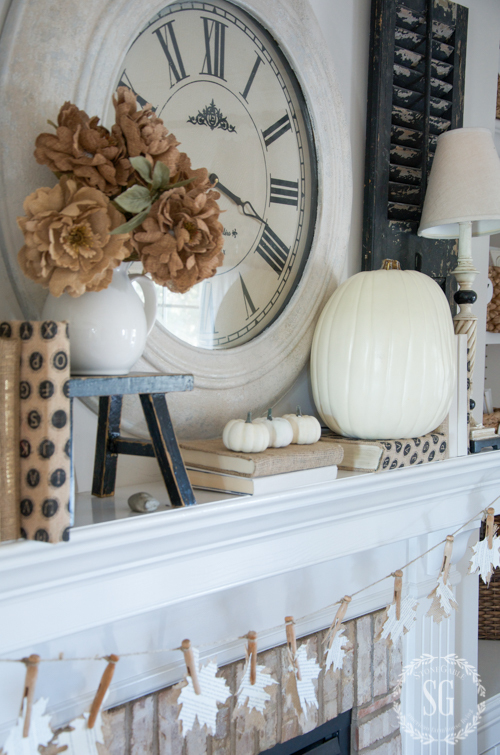 Love your softer side of Fall decorating! I’m collecting white serving pieces and digging out some I had forgotten about. 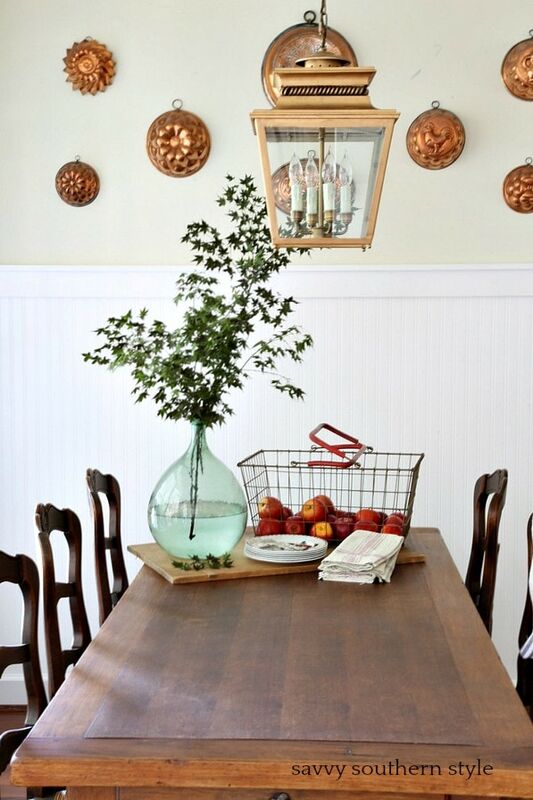 The garland is so simple but it adds such charm to the decor. I may give it a try but with brighter paper for my dining room. I love how you’ve decorated for fall. 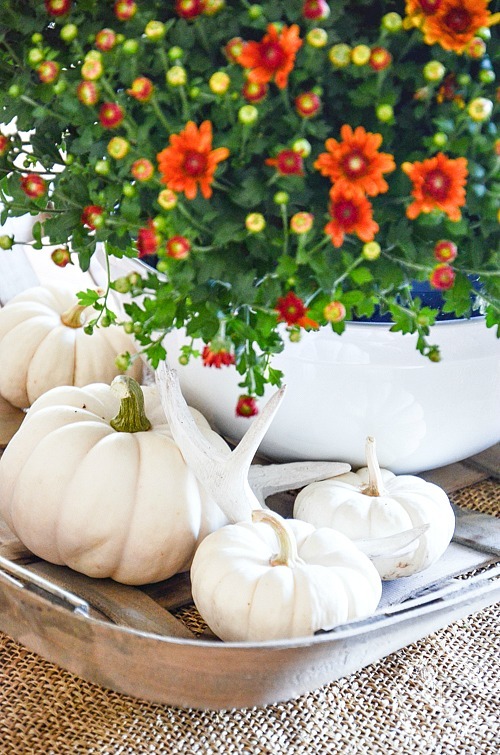 I love the white pumpkins and the mums. 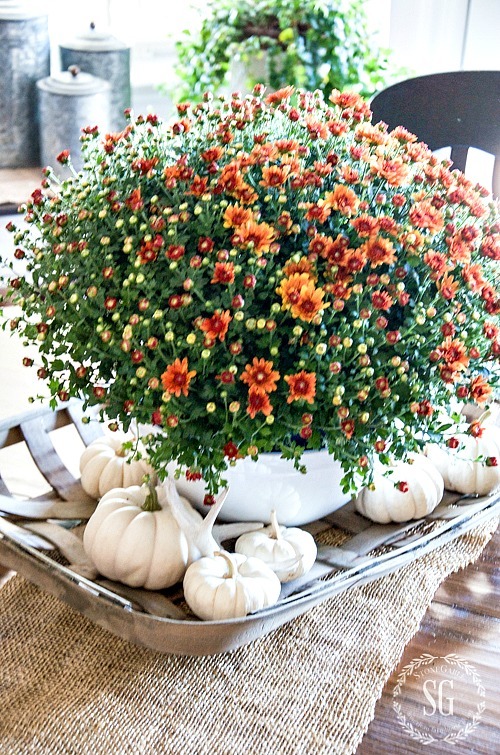 You do have the best mums … and they are so perfect with the white pumpkins! Pretty sure I’ll be borrowing the idea for the old book page garland – it is just wonderful. Love all your fall decorating. You have a lovely home, thanks for sharing. Enjoy your weekend. I love the “soft side of Autumn” you have shown. The beautiful pumpkin pillow on the sofa is such a perfect touch. 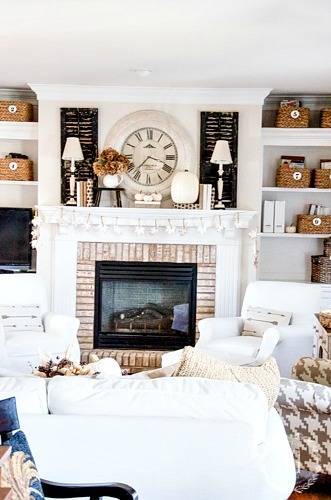 Oh so lovely and cozy! It’s a beautiful fall day here in southwestern PA…..and I thank you for the inspiration!! It’s time to do the mantle! Have a great weekend! I bought a big bag of those peg wooden clothes pins at a rummage sale this spring, now I know exactly how I am going to use them thanks to you! My mantle has been inspired because of your beautiful house! So pretty! I especially like your pillows and how you add “leaves” and pumpkins in your dish displays. I never get tired of looking at your home!! 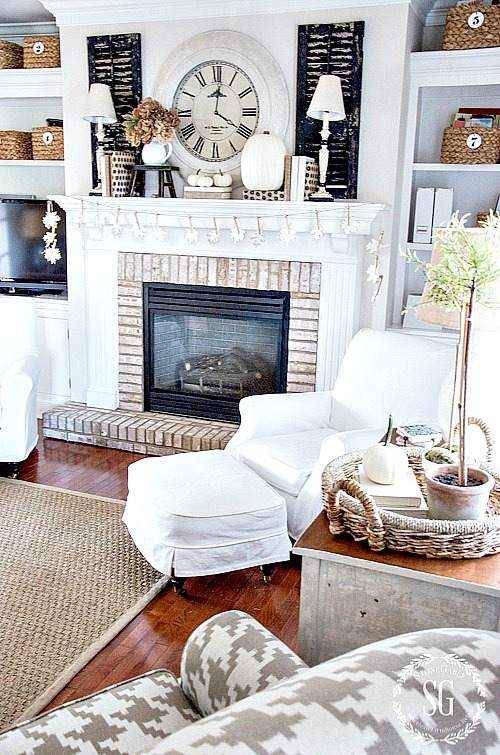 Would love to do more white in the furniture but not possible at my house! I’ll just keep looking at yours!! 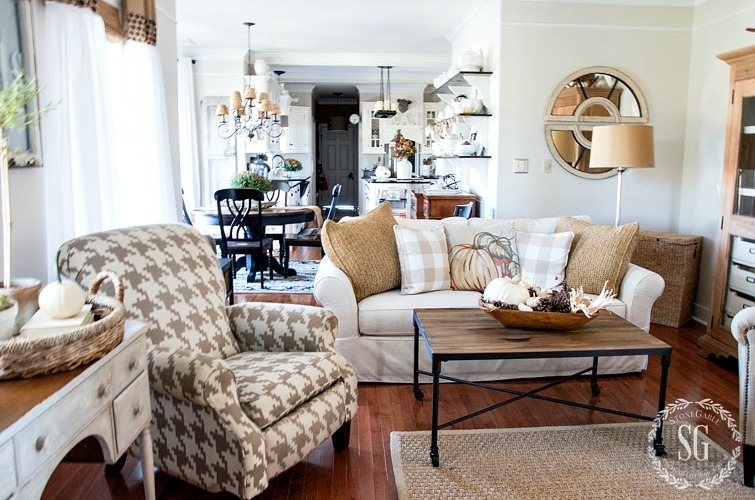 Love how you incorporate fall colors with your white/neutral color palette!!! Such beautiful taste Yvonne!!! 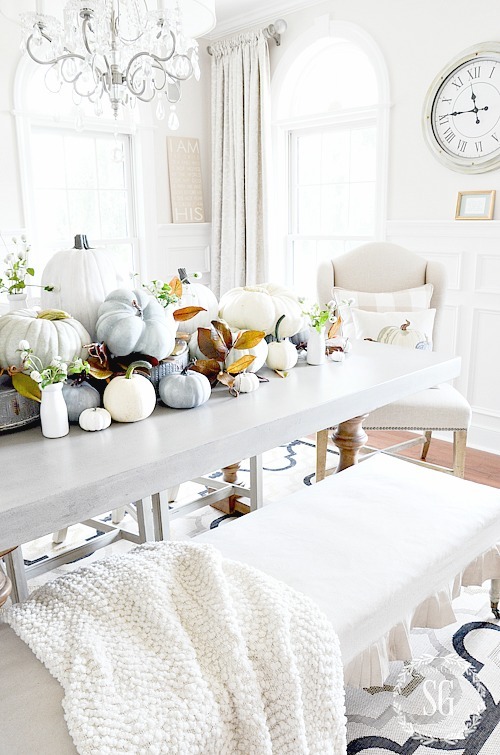 I love the white pumpkins! The white leaf garland is fabulous. You inspire me so much! 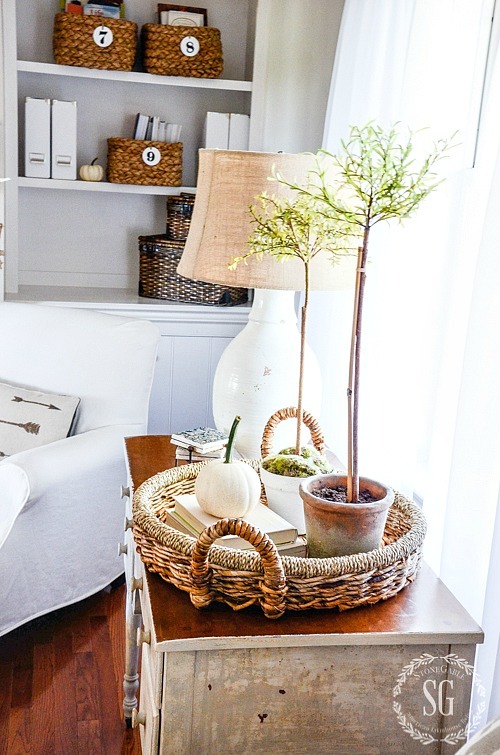 Love how you tuck little touches of fall all over your beautiful home. Love your softer look for this fall. I am pretty much using my brightest fall colors outside this year but still have some pops of color with my more subdued beige and white decor. 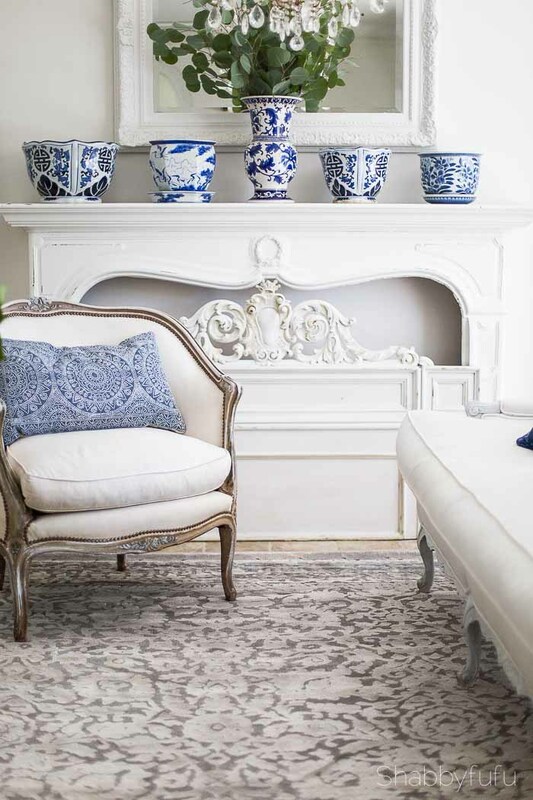 Your advice to use neutrals for our walls and large pieces of furniture makes seasonal decorating so much easier. Thanks Yvonne. I loved all of your white pumpkins……. I love your coffee table! I have enjoyed these early Fall pictures. It’s giving me the inspiration I need. Now if we can just get the weather to start cooling down. I’m pulling out my Fall and pumpkins in two weeks! 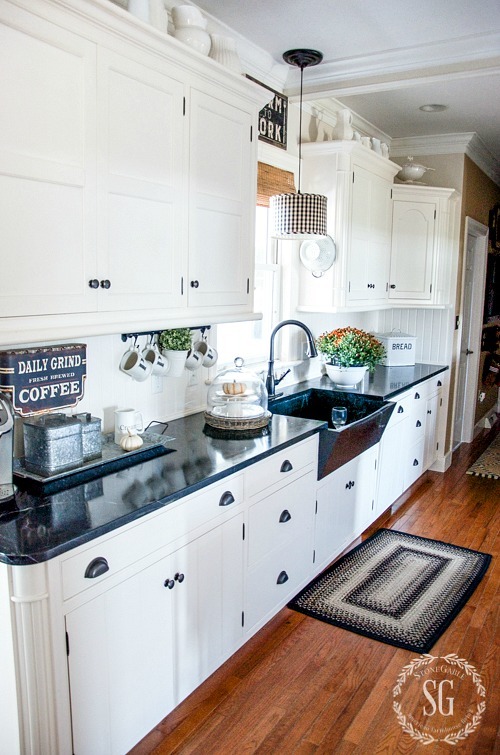 I love every bit of your gorgeous home! It is so warm and inviting. Love the softer side of Fall. Many great ideas! Can you suggest a source for the olive topiaries? I’m having no success finding any similar to yours. Everything looks gorgeous! 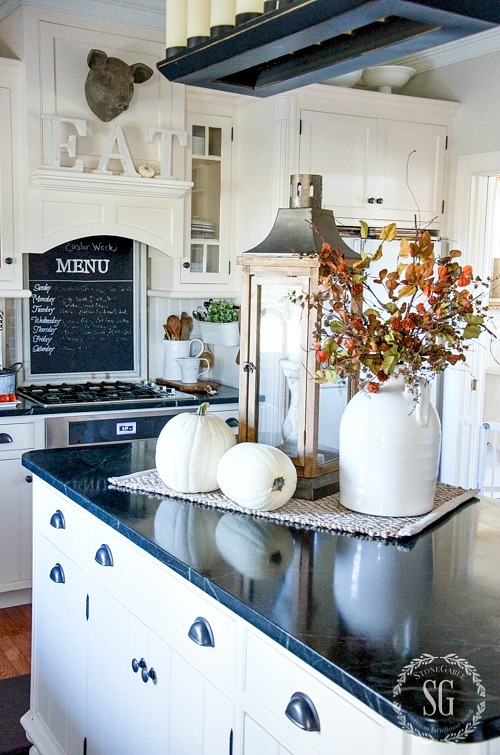 Love your fall touches.